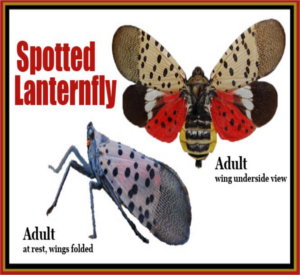 The spotted lanternfly, an invasive moth from Asia, has been found in Yates County. According to the State DEC and Agriculture and Markets, a single adult insect was found a private Keuka Lake property in Penn Yan. The spotted lanternfly (SLF) is a destructive invader that feeds on more than 70 plant species including maples, apple trees, grapevine, hops. Besides stressing plants by feeding on them, the SLF also produces a sticky “honeydew” that attracts mold that interferes with plant photosynthesis, affecting growth and fruit yield. A single adult lanternfly was previously discovered in Albany County. SLF spread primarily through human activity and DEC officials say they lay their eggs on a number of surfaces, including vehicles, stone, rusty metal, outdoor furniture and firewood. The public is encouraged to inspect outdoor items, and anyone visiting the Pennsylvania or New Jersey Quarantine Areas should thoroughly inspect their vehicle, luggage, and gear before leaving. Anyone suspecting they’ve found SLF is encouraged to send a photo to spottedlanternfly@dec.ny.gov, along with information as to location, egg masses, and/or infestation signs. The Steuben County Sheriff’s Office reports the arrest of two subjects on warrants. 48-year-old John Manhart of Hornell was taken into custody as an alleged fugitive from justice from Potter County, Pennsylvania. It’s alleged that an active warrant was issued for Manhart from charges stemming from 1993, and a warrant from 1995. Manhart was sent to the Steuben County Jail without bail, awaiting his extradition hearing. 52-year-old Billie Jo Chrisler of Corning was taken into custody for allegedly violating a term or condition of her probation. She was also sent to the Steuben County Jail without bail. Two Steuben County deputies were honored Monday for their heroic actions during the July 2 incident that took the life of state Trooper Nicholas Clark. County Sheriff Jim Allard commended deputies Joshua Day and Jordan Walrath before the county Legislature Public Safety and Corrections Committee, saying the men’s action saved lives and prevented an escalation of the fatal incident. The sheriff said Deputy Day's actions, while under fire, moving a wounded Trooper Clark to safety, and maintaining tactical awareness, exhibit bravery, coolness under fire and extreme valorous conduct. The sheriff added that the actions of Deputy’s Day and Walrath reflect the leadership, professionalism, integrity and service of all members of the Steuben County Sheriff’s Office, and their personal commitment to the mission of public safety to the citizens of Steuben County. The Painted Post Fire Department revealed a new memorial Tuesday in honor of 9/11. The department will officially unveil the monument during Fire Prevention Week, at an open house and pancake breakfast on the first Sunday in October. The event will be open to the public during the breakfast. Cost will be $5. The remains of an area soldier killed in a plane crash in Alaska will make the final journey home next month after 65 years. On November 22, 1952, a military plane crashed on Mount Gannett, killing all board. In June of 2012, debris of an aircraft was located and DNA evidence confirmed the remains of Eugene Costley. Costley was from the Elmira area. WETM 18 News will have coverage of the homecoming. A rebuilt Curtiss Model F Flying Boat will take to the skies during the Glenn H. Curtiss Museum’s “Wings and Wheels in Hammondsport” event this Saturday and Sunday. The flying boat will take off from Keuka Lake during the event’s seaplane demonstrations and it will also be on display for visitors to see up close. Workers will be on hand to discuss how it was restored. Wings and Wheels will also feature a “Salute to Glenn Curtiss” seaplane parade around Keuka Lake, a car show with classic and exotic cars, and an on-location broadcast with us, WVIN. The free event runs both Saturday and Sunday from 10 a.m. to 4 p.m. The first Steuben County History week, set for October 1st through the 7th, will look at the World War I and II heroes who served their nation at home while their loved ones battled aboard. The week will feature exhibits at the Bath VFW assembled by local historical groups and hosted by costumed guides who will take both the public and school students through the exhibits. The iconic Rosie the Riveter will also make an appearance as a reminder of America’s women who filled the factory jobs left vacant as men went to war. The finale of History Week will be a presentation by Kirk House, director of the Steuben County Historical Society, followed by a salute to the USO.